Thomas Lincoln came to America via the ship Diligent in 1638. It sailed from Ipswich, Suffolk, England in June and landed at Boston Harbor on August 10, which means Thomas was not quite 16 years old. 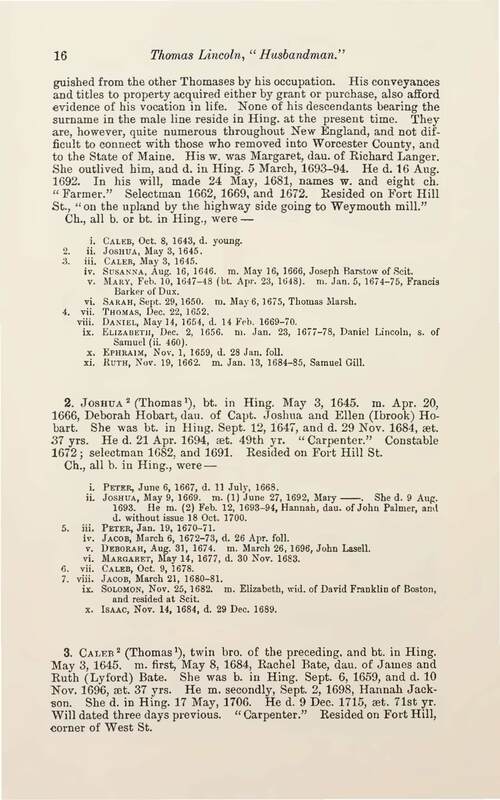 The entire passenger list of the ship is detailed in "The Planters of the Commonwealth", by Charles E. Banks, pages 191 - 194, and is detailed on several web pages. The manifest of the ship lists as passengers his mother, Joan, and his brother, Stephen (along with Stephen's wife and son). There is no mention of the father of Thomas, and although some have stated the father's name is Stephen, I have been unable to verify that. The documents shown on the side show that Thomas did well for himself. 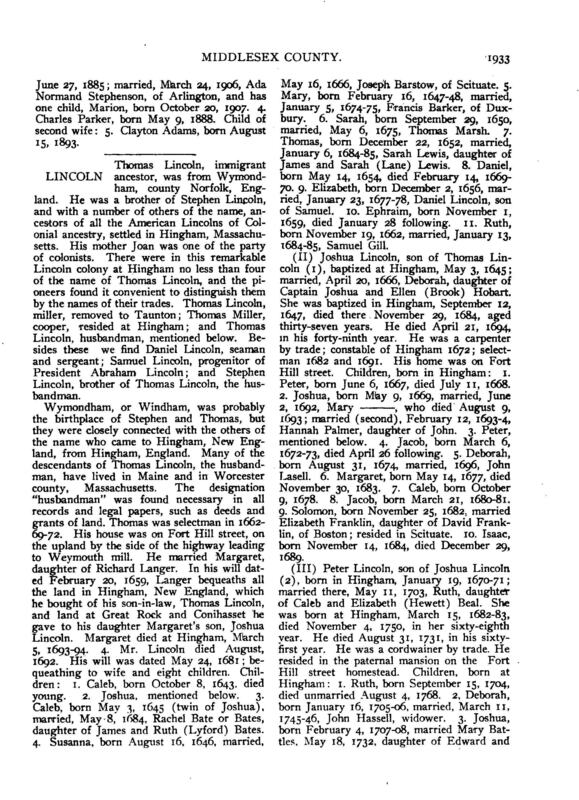 He lived on Fort Hill Street and was at times a selectman for the town of Hingham. Four years after he arrived in America, he married Margaret Langer and lived until he was 69 years old. The birth of his wife, Margaret Langer, is unknown. 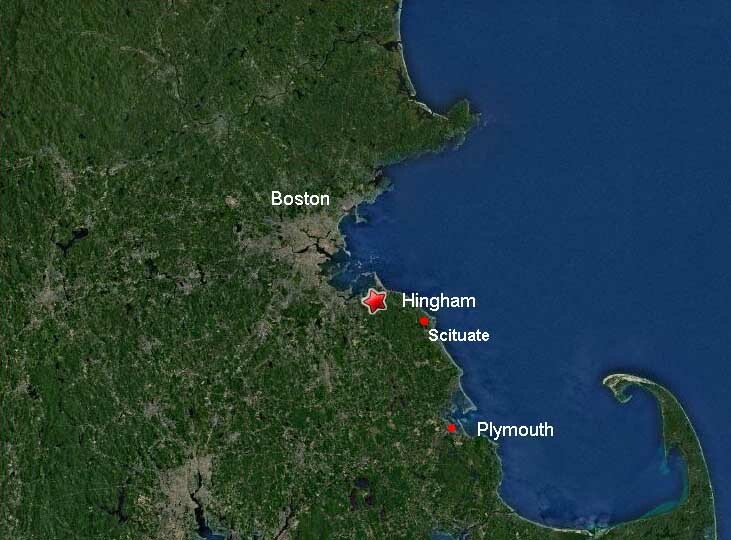 She died in Hingham, Massachusetts on 05-Mar-1693 or 1694. 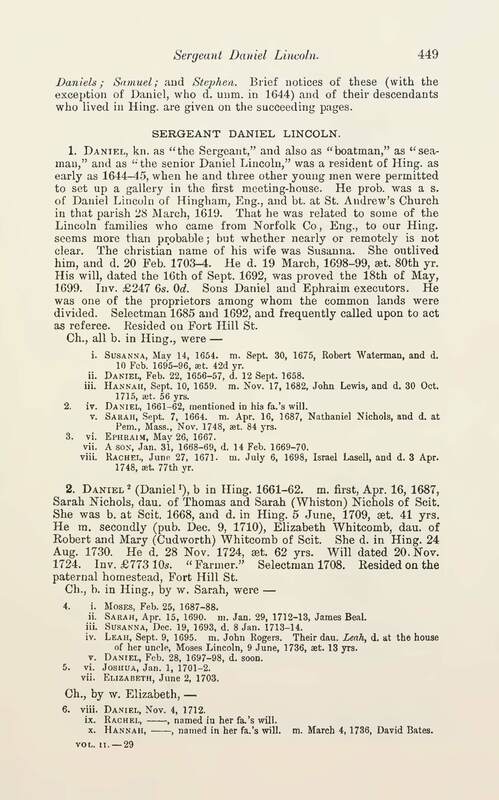 She was the daughter of Richard Langer, who, upon his death, bequeathed his land to Joshua Lincoln, son of Thomas and Margaret. 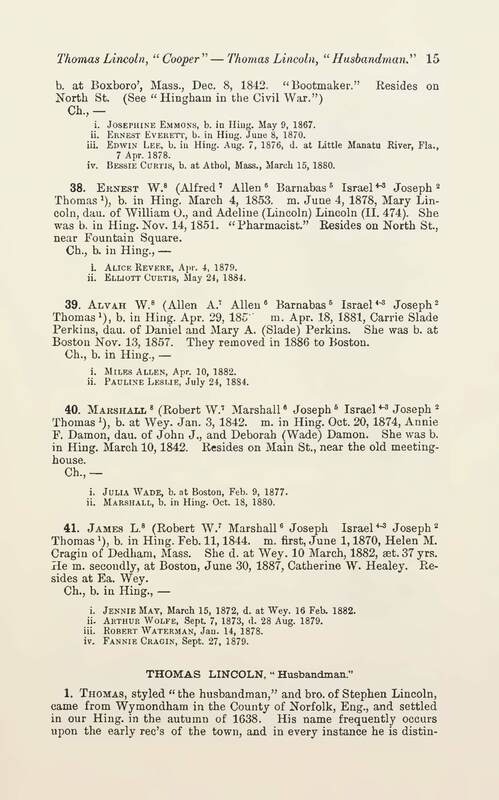 All the children of Thomas and Margaret were born or baptised in Hingham, Massachusetts. Of the six sons of Thomas and Margaret, three lived to adulthood and had children: Joshua and Caleb (the twin brothers), and Thomas. 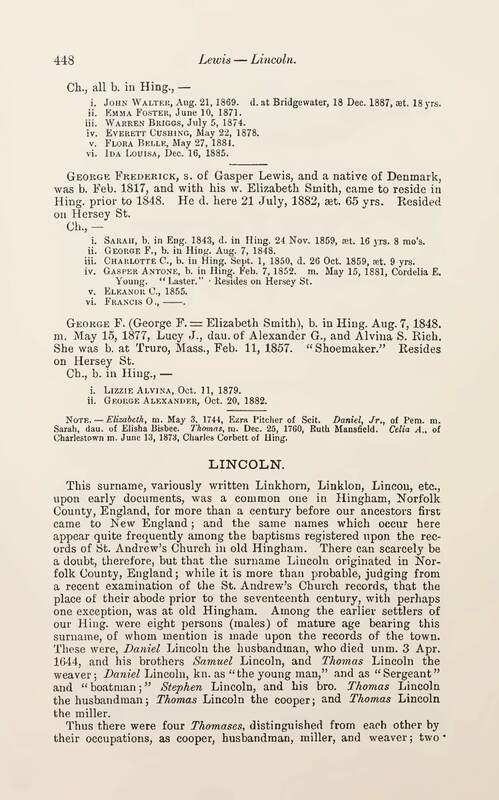 History of the Town of Hingham, Massachusetts, George Lincoln (editor), 1893, Vol. II, pages 448-9, and Vol. III, pages 15-16. 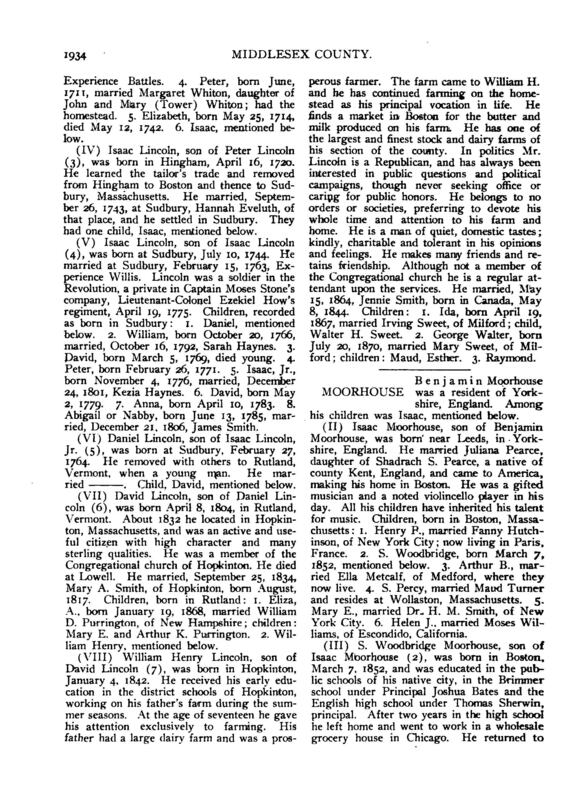 Historic Homes and Places and Genealogical and Personal Memoirs Relating to the Families of Middlesex County, Massachusetts, William Richard Cutter (editor), 1908, Vol. 4, pages 1933-34.